For other uses, see Point (disambiguation). 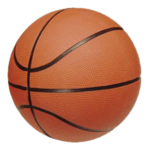 Points in basketball are used to keep track of the score in a game. Points can be accumulated by making field goals (two or three points) or free throws (one point). If a player makes a field goal from within the three-point line, the player scores two points. If the player makes a field goal from beyond the three-point line, the player scores three points. The team that has recorded the most points at the end of a game is declared that game's winner.